"Existentialism was one of the leading philosophical movements of the twentieth century. Focusing on its seven leading figures, Sartre, Nietzsche, Heidegger, Kierkegaard, de Beauvoir, Merleau-Ponty and Camus, this Very Short Introduction provides a clear account of the key themes of the movement which emphasized individuality, free will, and personal responsibility in the modern world. Drawing in the movement's varied relationships with the arts, humanism, and politics, this book clarifies the philosophy and original meaning of 'existentialism' - which has tended to be obscured by misappropriation. 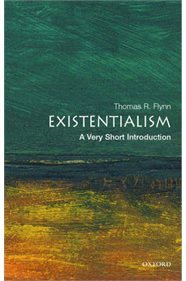 Placing it in its historical context, Thomas Flynn also highlights how existentialism is still relevant to us today. ABOUT THE SERIES: The Very Short Introductions series from Oxford University Press contains hundreds of titles in almost every subject area. These pocket-sized books are the perfect way to get ahead in a new subject quickly. Our expert authors combine facts, analysis, perspective, new ideas, and enthusiasm to make interesting and challenging topics highly readable."